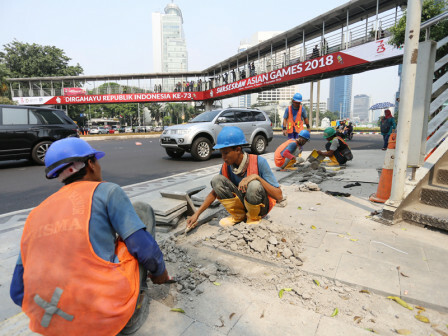 Jalan Jenderal Sudirman-MH Thamrin sidewalk arrangement work is accelerated ahead of Asian Games that will be held from August 18, 2018.
" We will accelerate our work within this week"
"We will accelerate our work within this week," affirmed Heru Suwondo, Acting Jakarta Bina Marga Dept. Head, Tuesday (5/24). He conveyed, sidewalk arrangement is mostly finished, but his side just needs to complete several building entry lines then finishing. "Sometimes we need to polish several areas though it looks neat," he added. According to him, his side has completed all routes that will be used by Asian Games athletes from Main Stadium of Gelora Bung Karno (SUGBK). "Governor already seen it directly. All becomes flat and black," he mentioned.